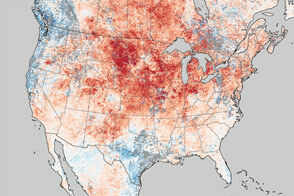 For many residents of North America, the winter of 2013-14 has felt like one of the coldest in many years. Waves of Arctic air brought extended periods of cold weather and above-average snowfall to the middle and eastern portions of the United States and Canada. Seven Midwestern states had one of their top-ten coldest winters, and the Great Lakes were chilled until they reached nearly 91 percent ice cover. Even portions of Mexico and Central America were cooler than normal. But human memory is not a scientific measure, and long-term perspective tends to get lost in everyday conversation and news coverage. The winter of 2013-14 followed two winters that were significantly warmer than the norm, which likely made this season feel worse than it was. 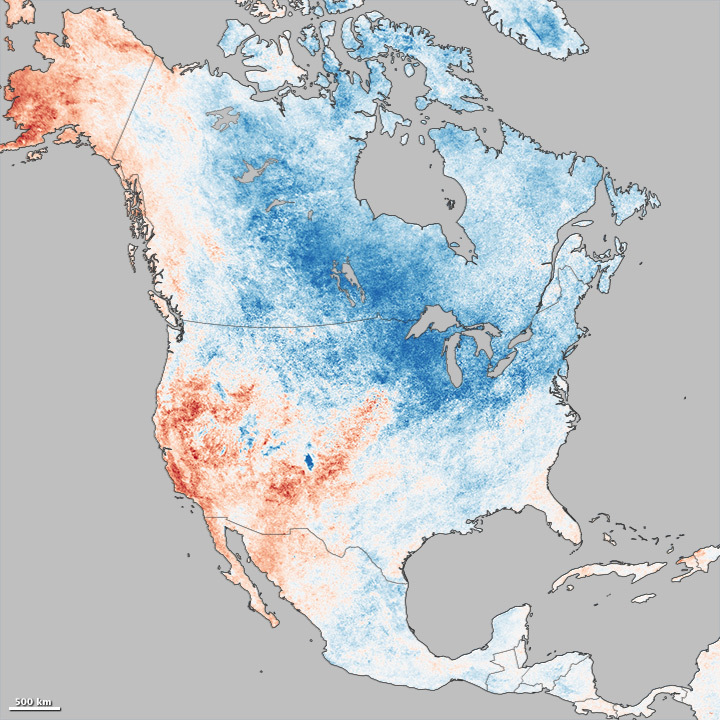 Researchers at the U.S. National Climatic Data Center (NCDC) reported that the average temperature of the contiguous U.S. for the winter was just 0.4° Celsius (31.3° Fahrenheit), about 1°F below average. 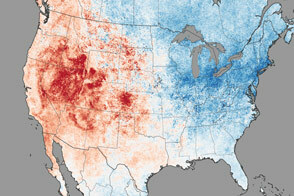 The map below puts the North American winter in wider context. On a global scale, land temperatures for the December through February period were actually the tenth warmest in the modern record, according to NCDC, 0.87°C (1.57°F) above the 20th century average. Far eastern Asia, particularly China and eastern Russia, were significantly warmer than normal. In Europe, Austria and The Netherlands observed the second warmest winters in their records, and Switzerland its third warmest. With temperatures as much as 5°C above normal, spring crops and plants began sprouting several weeks early across much of Europe. 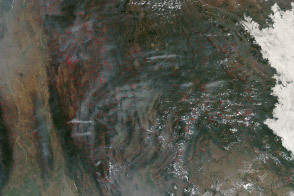 And in the southern summer, the extended heat waves in Australia and Argentina stand out. 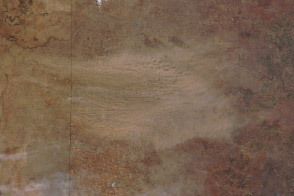 NASA Earth Observatory images by Jesse Allen, using MODIS data from the Land Processes Distributed Active Archive Center (LPDAAC). Caption by Michael Carlowicz. Though the talk in much of the United States was about polar vortices and wicked cold snaps, the wider world was actually warmer than normal. 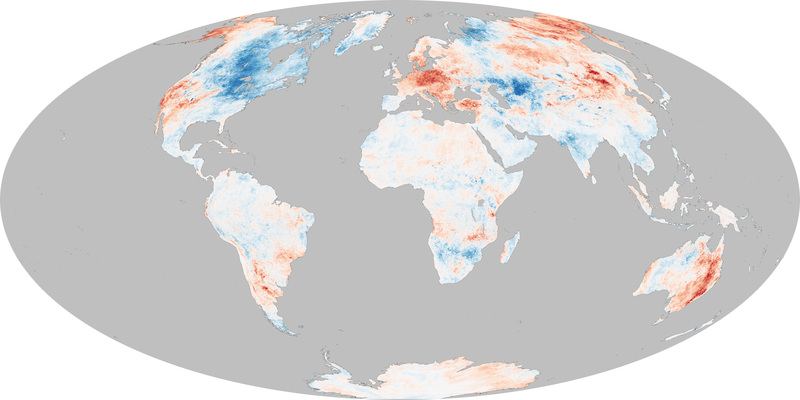 National Climatic Data Center (2014, March) State of the Climate: February 2014 National Overview. Accessed March 19, 2014. National Climatic Data Center (2014, March) State of the Climate: Global Summary. Accessed March 19, 2014. National Climatic Data Center (2014, March) Winter Cold: Historical Perspective. Accessed March 19, 2014. USDA Foreign Agricultural Service (2014, March 12) Europe Mild Winter Advances Crop Stage. Accessed March 19, 2014. Weather Underground, Jeff Masters' WunderBlog (2014, March 14) Winter of 2013-2014: Top 10 Coldest in Midwest; Warmest on Record in California. Accessed March 19, 2014.